"I Write Sins Not Tragedies" recorded San Diego, California. "Lying Is The Most Fun..." recorded live Denver, Colarado. ▓ Aardige plaat van "Panic! At The Disco" !!! Volgens mij niet echt nieuw meer, maar hij komt nu pas in de Nederlandse Top 40 binnen van 21-10-2006 ??? Precies 4 sterren !! !<br><br>"Now I'm of consenting age to be forgetting you in a cabaret<br>Somewhere downtown where a burlesque queen may even ask my name<br>As she sheds her skin on stage<br>I'm seated and sweating to a dance song on the club's P.A.<br>The strip joint veteran sweeps you away<br>Smirking between dignified sips of his dignified peach and lime daiquiri<br><br>And isn't this exactly where you'd like me<br>I'm exactly where you'd like me, you know<br>Praying for love in a lap dance and paying in naivety<br>Oh, and isn't this exactly where you'd like me<br>I'm exactly where you'd like me, you know<br>Praying for love in a lap dance and paying in naivety<br><br>Oh, but I'm afraid that I<br>Well, I may have faked it and<br>I wouldn't be caught dead in this place<br>Well I'm afraid that I<br>Well that's right<br>That I may have faked it and<br>I wouldn't be caught dead in this place<br><br>Praying for love and paying in naivety"
Sicher nicht das beste von Panic! At The Disco, aber immerhin gut. Klingt exakt wie die Vorgängersingle (Übertreibungen rocken! ), insgesamt auch gar nicht mein Fall, die Band. Haargenau eine 3,5*, völlig willkürlich aufgerundet. Bin eigentlich ein Fan von übelstem Alternative-Dreck, doch der hier nervt zu sehr. Das Ganze ist mir bei Panic! At the Disco einfach immer eine Spur zu überdreht. Kann damit nicht viel anfangen. Lockerer Song mit Piano. Da geben wir doch glatt mal vier Sterne! Genau @phili92....nicht so oft ! Nett ist das kurze Kirmes-Interlude zwischendrin. Ansonsten Emo-Durchschnitt wie gehabt - trotz Piano. Neu war das saugeil und eine riesen Hetz!<br>Kann ich heute kaum nachvollziehen. My fave Panic! At The Disco song to date, almost worth a 6. I never knew this was a single or that it even charted. It's pretty good though. Quite suggestive but my absolute favourite of theirs. 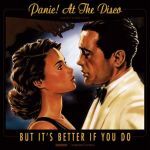 Also my favourite from Panic at the Disco.<br><br>Edit: Not anymore, Ready To Go (Get Out Of My Mind) is now, but this is still good now. Excellent track, but not as awesome as I Write Sins Not Tragedies. Very good, the accordian is a great inclusion. Amongst the best P!ATD songs. Not as good as "I Write Sins Not Tragedies" or other tracks from them but I like it a lot. Definitely one of the highlights from "A Fever You Can't So Sweat Out". Very catchy without you realising it initially. I also always tend to forget how catchy it is when I haven't heard it in a long time. So pleased it was a chart hit. Sie geben mal wieder alles. Fun track, although I prefer the singles either side of this. Awesome track, one of their best!